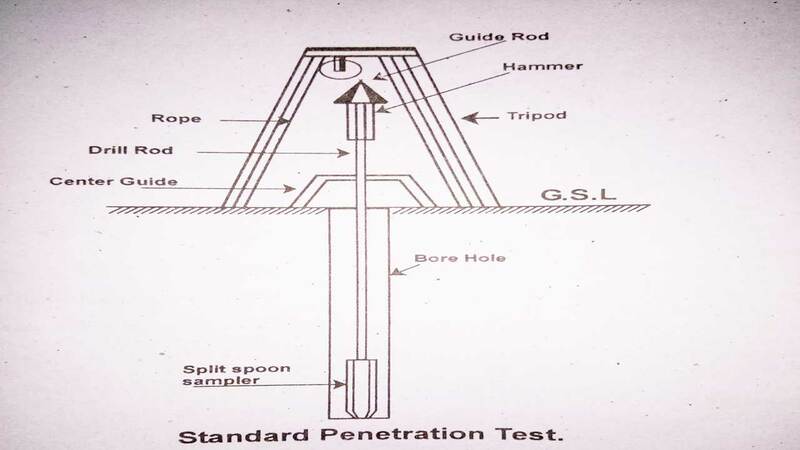 Standard Penetration Test (SPT) of Soil - Procedure, Tools, Precautions. Q & A about Standard Penetration Test. The Standard Penetration Test (SPT) is most popular and economical test to determine the surface information, both on land and offshore. This test is widely used to obtain the bearing capacity of soil. 3. Drop hammer 65 kg (140 lbs ). The number or blows required for 12 inches penetration resistance of the soil. It is generally referred as the ‘N’ value and measured in blows/unit penetration. The Standard penetration test ( SPT ) is widely used to get the bearing capacity of soil directly at a certain depth. The consistency of clayey soils can often be estimated from this test. When a borehole is extended to a predetermined depth, the drill tools are removed, and the sampler (split spoon) is lowered to the bottom of the borehole. The sampler is driven into the soil, by hammer blows to the top of the drill rod. The standard weight of the hammer is 140 lbs. (62.3 N) the number of blows required for spoon penetration of three “6” inches (15 cm) intervals is recorded. The number of blows required for the last two intervals are added to give the standard penetration number at that depth. 1. Erect the tripod over the test hole and assemble the unit. 2. Allow the spoon to rest on the bottom of the hole. 3. Drive the spoon with blows from the hammer falling 75 cm (30 inches), until either 45 cm (18 inches) have been penetrated or 100 blows have been applied. 4. Record the number of blows required to effect each 15 cm (6 inches) of penetration. The first 6 inches is considered as seating drive. 5. The number of blows required for the second and third 15 cm (6 inches) of drive added is recorded as the penetration resistance value N of the soil. NO. of blows / 15 cm. The penetration resistance value, N of the soil is _________________blow . Formula: q= 3.5 (N-3) [B+0.3/2B]Rw2Rd. q= Allowable net pressure in T/m2. N = Standard penetration number. B = Breadth of footing in meters. Rw2 = Water reduction factor= 0.5 [ 1+Z/B] . Rd = Depth factor = l+D/B C or C= 2.0. Z = Depth of water table below foundation level. 1. If the test is to be carried out in gravely soils, then the driving shoe is replaced by solid 60-degree cone. 2. Below the water table, care should be taken to avoid entry of water through the bottom of the bore due to loosening of soil happens. 3. Water should be added as necessary to maintain the water table level in the bore hole. 4. If the test is carried out in very fine sand or silty sand below the water table the measured “N” value if greater then 15, should be corrected for the increased resistance excess more water pressure set up during driving and unable to loose immediately. 5. Drilling mud can be sued to support the sides of the hole. 6. Stop dropping weight, when the sample penetrates less than 25 mm under 50 blows. Ans: 75 cm or 30 inches. Ans: 45 cm or 100 blows. What is the formula for correction of N blow. I usually use the Terzaghi and Peck empirical formula of 1948. Prasad yes its good you can use that formula. When you stop the spt test?